I’m back in Denmark after a mixed quality flight and insanely wrong airline punctuality. San Francisco has treated me well and now I’m in the middle of my exam project. Shortly after my arrival, my beloved and I helped these guysÂ moving in together, which involved a lot of furniture, consumer electronics and a third floor without an elevator. Afterwards we went out for a beer with a view on the little lake in this town. Right now my work/blog space is a little improvised and consists of a rooted and freshly unlocked smartphone and a laptop, but since I’ve worked under similar conditions for the past months, it should be fine. The past three weeks I’ve partly dedicated to writing my twitter clone ROARER and today from 08:00 until 11:00 I will be online there. Join everybody who reads this and can spare the time plus the people at my university in trying it out in that time! Yeah, I kind of needed / wanted to do this one too. This is my report for the 3rd semester specialisation at the Nordic Multimedia Academy. 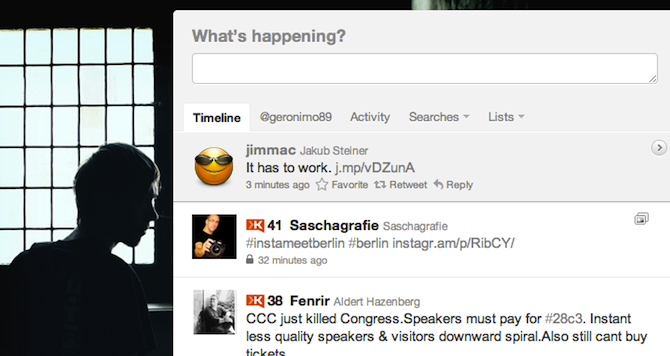 My coded twitter clone will be available when I release it for alpha. Computer programming is tremendous fun. Like music, it is a skill that derives from an unknown blend of innate talent and constant practice. Like drawing, it can be shaped to a variety of ends â€“ commercial, artistic, and pure entertainment. Programmers have a well-deserved reputation for working long hours, but are rarely credited with being driven by creative fevers. Programmers talk about software development on weekends, vacations, and over meals not because they lack imagination, but because their imagination reveals worlds that others cannot see. As the leading quote, this objective shall for me use principles that naturally further clean code and to split tasks for easy and fast cooperation and maintenance. To code is not that special nowadays as it was before, but to have a high standard and make your software understandable for others is a progressive trend through social coding and sites like github.com, jsfiddle.net or cloud9.com. Creativity is important for every programmer. To lead this creativity into the right channels, without hindering the workflow, there are architectural guidelines like MVC. It’s short for Model-View-Controller, which I will explain at a later time. Good programmers use their brains, but good guidelines save us having to think out every case. The MVC architecture divides a program in three different units, that interact with each other in a specific way. These conventions are in the beginning sometimes seen as a little annoying, but I personally swiftly got used to them and appreciate this way of development. One of the most popular MVC frameworks, Ruby on Rails, runs on twitter.com. The Model is the part of the program dealing with data storage, reading and writing data to a database. This can be both table based or document based like Googleâ€™s BigTable or the CouchDB. A View generates visible output for the user. It’s used to display information and also elements for interaction with the rest of the program. As the name already states, the Controller controls the program. A Controller tells the Model which data to get or to write and the Views which to display. Retrieving data when needed, instead of re-generating and re-transferring results with every click, saves both bandwidth and time. Since the development time of a software project usually is significantly smaller than the hours spent using it, it makes perfect sense investing time for development to save time and money on use. AJAX prevents us from hammering the refresh button, when we’re waiting for an email to arrive and using a webmail interface or show us which users are visiting the websites we are maintaining in realtime (smartly used in piwik). The only people who have anything to fear from free software are those whose products are worth even less. As jQuery, CodeIgniter is quite famous. The framework is developed by EllisLab, but everybody can contribute, fix bugs or add features through github. As it simplifies a lot of everyday tasks for developers and provides a strong and clean structure through the MVC architecture it has built a solid reputation through the past years. For me, the two most incredible use-cases of AJAX are the operations you either can’t or don’t want to do on the client side, therefore the data is either processed on the server side or just gotten from a database, with checking for authentication and so on. You could say: AJAX is only for those, who have too much traffic, they only save bandwidth with it. I beg to differ. It can also significantly increase the usability on your website. Waiting is boring and will scare your users away, so you try to give them updates and notifications as quickly and as uncomplicated as possible. The way to do that is AJAX. Twitter has quite elegant use of AJAX all over their page. The most obvious may be the new tweets button. When a new tweet appears in a timeline or in search of a tag, there is a little button on top of the page, that indicates when new tweets have been published. ï¿¼ï¿¼Why not just put them in there? Because users might not like it. Scrolling output is for running processes on Linux machines, that only geeks handle for monitoring. What else is handled through AJAX, is user profiles. When you scroll through a list, your own timeline or a tag and click somebodies username, the profile is loaded in the right sidebar. Now, let’s say we have a list of ~100 people and 20 of them have tweeted recently, no profiles are loaded at first. When you click a username, the profile page of the according user appears, showing the recent 3 tweets. By using AJAX you save database (or cache) queries for 60 tweets, statistics for followers, following, amount of tweets and listings for 20. This already sounds like a good deal, right? You may have noticed, that the small red squares show up when you have new messages, notifications or invitations to events on facebook. I’ll not go deeper into this, because this is very similar to twitters, just that the updates are put in a small drop-down box, instead of being pushed into the main content area. 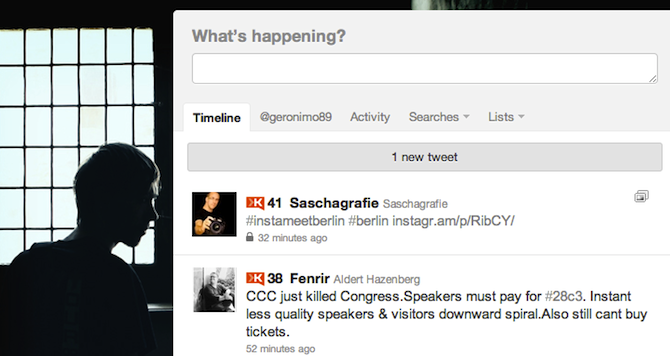 What I think is more interesting is, that when you reach the bottom of a timeline, new content is loaded automatically. The Model View Controller architecture is used in the aspiring Ruby On Rails framework, which is used by for example Google, Twitter, amazon.com, Yahoo! and BBC. One of the most common PHP frameworks in that category is CodeIgniter which is used to power modelportalen.dk. If we look at the projects, their services are not the most simple to provide. The characteristics they share are heavy workload, the user expect them to have a high uptime and without errors at any given time. Also neither the maintenance nor the development of the above mentioned is a one-man show. How does MVC contribute to a collaborative development process? MVC does more than splitting the jobs into three parts. Current version control systems do more than just to check if a file has been changed. It automatically merges the newest lines together, and only if one line has the same line changed in two different ways, manual work has actually to be done. 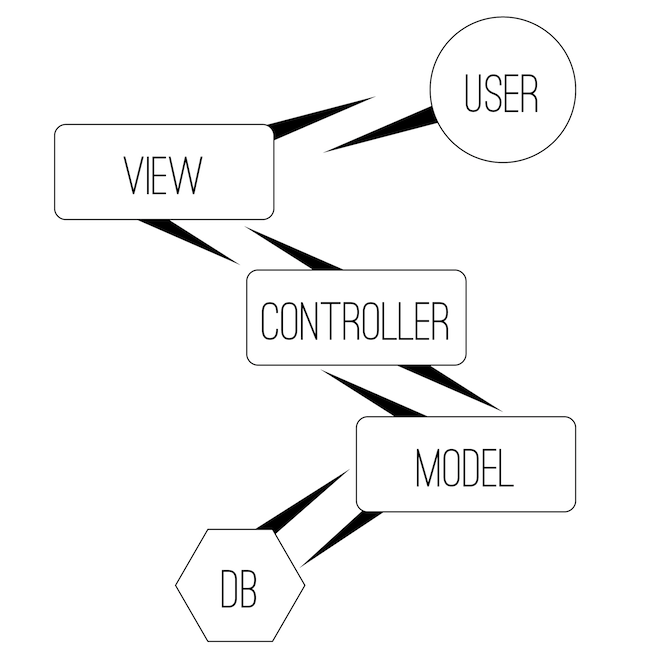 With an MVC architecture you would naturally divide your workload into two teams. The web designers / frontend developers would work on the Views, where the developers would stick to the controllers and models. Of course, many others are possible and complex projects require more planning, but it’s already easier and faster, than to hardcode output or write an extensive backend system for placing elements. Wordpress, in contrast, is a fully featured CMS, so the comparison might sound a little misplaced, but adding functionality to a website that is powered by WordPress usually happens through plugins and modifying the functions.php file within the theme folder. This offers a lot less flexibility to development team, than the above mentioned division. To start without combining the MVC and AJAX right away, this is a simple login form test in AJAX. The only AJAX specific thing here, is the empty div at the bottom of the page and of course the included script files. The status div will be used to insert the information that the script gives back upon a users login attempt. Here we see a contrast to an MVC attempt, as this just is a dummy php file doing the checking, it’s okay to user print and echo, which you would not do in an MVC application, you would load a View. How does AJAX change the work of a programmer? Second, you have to keep elements on the same page very modular and easily accessible in the DOM. That sometimes means more encapsulating elements and also writing scripts that only output specific parts of the page, the ones that either are loaded later on or refreshed in page during a visit. How does MVC change the work of a programmer? This is more up to the programmer how he/she adapts it. Also how extensively the division into the three parts is undertaken. Basically you CAN make some calculations on output in the View, but you shouldn’t. Also you should not make a Controller output Data directly, around a View, but make it a variable in a View. Data should be ready for display when they leave the Controller. The really big advantage of working with MVC is the teamwork. The requirements to the individual parts can be very specific, so misunderstandings can be minimized. When pulling off a project with, for example, a designer and a developer, the designer can send his requirements for the pages in a list and the developer makes sure these data sets are included when the View is loaded, so it can be ordered and styled in the output. This way the two can work both on what they’re best at. Both using a solid architecture and enhancing user experience through faster interaction is something you have to take care of, to create competitive web projects. In the paper above I’ve pointed out what is so helpful about the technologies mentioned and why I use them. In this post I want to present my personal favourites of the NoMA film festival fall 2011. All of the participants deserve a hand for their production and they got it the night of the show. I just want to point a couple of videos out that struck me the most. All videos can be viewed on the NoMA film festival youtube channel. The order of the videos is random and I’d like to recommend every reader to go to the youtube channel and see all of them. You know the feeling when everything seems to move into the wrong direction? Me too. The quality of this video, combined with the great timing to the music struck me. It’s a nice portrait of the main character and the love for music is very believable for me. In this I primarily want to point out the effects and the concept. It just works. The timing, the perfect coexistence of video footage and visual effects. This video won the spirit award and also for me it’s some kind of pure positive energy. Creative, barefoot, lighthearted, without worries. This is the video that personally made me laugh the most. It may seem a little more strange, when you don’t know the main characters affinity to hard electronic music. First world problems? There are websites about them, internet memes and everybody is kind of fed up with people whining about nothing, right? This video puts exactly that on the stage and reminds us, that it’s not so bad after all. A humorous approach on a shizophrenic main character and his daily struggle with the voice in his head. The back and forth between the two is very interesting and I could not help laughing about the incredible voiceover. Thanks to everybody who was in this with us. Everybody made this possible. Make the interviewed feel comfortable, ask easy questions until they are. If questions are extracted from footage, ask them to incorporate the question.